Evanescence: Thrashing Guitars, Angelic Vocals Singer Amy Lee says she's equally inspired by metal and classical music, and that the two aren't all that different. Evanescence's self-titled third album is out this week. Goth metal has always been a niche genre, but over the years, a few artists have found ways to give it Top 40 appeal. 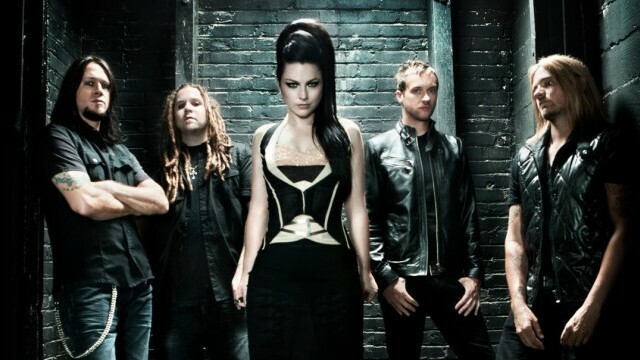 Evanescence has pulled off that trick with two multiplatinum albums: Fallen in 2004 and The Open Door in 2006, both of which unite loud, heavy guitars and drums with the ethereal voice of singer Amy Lee. "Being inspired by classical — and in high school especially, classical and metal both — I remember having this cool realization that they were really similar. It's just different instrumentation," Lee tells Weekend Edition Saturday host Scott Simon. "I love the aggression of the guitars against that fragility that, no matter what, exists in a female voice." She adds, "I can't help but be a girl, though." Evanescence made the classical-metal connection literal on The Open Door, which included a song based on a movement from Mozart's Requiem. This week, the band released its self-titled third album, which features harp playing by Lee in "Secret Door." "If you listen to any of our records, especially the last two, there's a big spectrum of feelings," Lee says. "There are songs that are big, epic rock songs, but then there's moments that are soft and fragile."